SOS is back at The Winchester Music Tavern (formerly 'The Bevy') ! The Tin Pan is Richmond's premiere Restaurant and Listening Room. Featuring live music, great food, and craft cocktails in a casual atmosphere. Call 804.447.8189 for tickets or purchase online at www.tinpanrva.com. Show starts at 8pm, 6pm doors. Tickets: $25 in advance/$30 at the door. Special guest Susan Greenbaum. On Saturday May 4th the tour will make a stop at Victorian Station (aka ‘The Big Pink’), located at 36 N Mallory St. in the historic Phoebus district of Hampton, Virginia. Victorian Station is a historic home now converted to a bistro and music venue. A delicious light fare menu, and a great selection of coffee, teas, beer and wine will be available for purchase during the show. Doors will open at 6:30pm, and the show starts at 7:30pm. Tickets are $20 in advance and $25 at the door. The Seventh Annual SIRENS OF SPRING TOUR featuring Mama's Black Sheep, Christine Havrilla & Gypsy Fuzz, and special guests Sweet Leda will have it's closing show at Main Street Tower in Bel Air!! Doors open at 5:30pm, the show will begin at 7:00pm. Reserved table/bar seating is available with advanced ticket purchase ONLY. 2pm BAND performance (after parade) at NEW SITE for New Hope Celebrates @ The American Legion Parking Lot at New St.
After the parade, continue enjoying everyones' company at this after-party at John & Peters at 96 S. Main Street, right down from the party! Duo show! Kick off Memorial Day Weekend w/ Christine at Murph's! Music 7-10 on the Dogfish Head Sponsored Stage! Christine hangs out at this great little spot in Lewes! Music 6-9 outside if nice weather! Pride Event with Christine's full band + special guest Meredith Rounsley, + vendors! More info TBA! EVENT STARTS AT 6PM! more info TBA on outdoors/food truck, etc...! Full band /Gypsy Fuzz show! Songs from the new album as well as fan favorites! Special guest Greenhouse Weeds open the night! 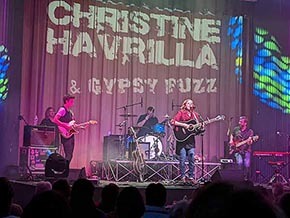 Get your tickets ahead at https://www.ticketweb.com/event/christine-havrilla-gypsy-fuzz-bryn-mawr-gazebo-tickets/9119995 Pack picnics, chairs, blankets for ths amazing outdoor summer concert series!!! This is always a special night b/c Christine used to live in Bryn Mawr & loves returning! 4th of July Weekend at the beach! DUO SHOW 8 or 8:30 PM TBA! Solo happy hour event at the winery! Christine makes her way back to NH! Saturday music w/ Christine 4-7 pm!! Duo show w/ Becca on drums! Music 8-11pm! Happy Summer! Christine & the band perform in the park! Bring your chairs & blankets! Duo show 8:30 - 11:30 pm! Christine returns to this eclectic venue in NY! Celebrate another summer! outside/food trucks/music! Christine returns to this eclectic vegan music bar!